For sunny holidays from Europe or to prolong your journey from Cairo or after a cruise on the Nile, the Red Sea sandy beaches are an easily reached destination: it’s an average 4 hours flight from Europe, less than an hour from Cairo and a 150 miles drive from Luxor. The weather is good for most of the year and the sea temperature allows year-round swimming, which is pretty tempting after the morose summer we have experienced this year! The Red Sea lies between Africa and the Arabian Peninsula, linked to the Indian Ocean by the Bab el Mandeb Strait and to the Mediterranean Sea by the Suez Canal. Its name comes from local red seaweed that live in some parts of its coasts. Although most of its waters are as blue as can be! It is known for ages for being the place where Moses led the Hebrews fleeing from Egypt across the Red Sea to reach the Holy Land. Nowadays it is famous for its wonderful vibrantly coloured marine life. Coral reefs find there an ideal environment to grow: over 200 species of soft and hard corals grow in these warm waters building colourful reefs. Those reefs attract innumerable animals: 1000 species of fishes, 1000 species of invertebrates (sea anemones, shellfishes…), 300 species of sharks, dolphins, dugongs, sea turtles, rays. No need to say that the Red sea is a divers’ paradise! They often say that diving in the Red Sea is like diving in an exotic aquarium swarming with colours and life. You will be able to see star fishes, bright yellow butterfly fishes, Picasso trigger fishes that resemble a picture of the famous painter, purple and red flasher wrasse fishes, clown fishes and so many others… 300 species of sharks live in the Red Sea but unfortunately they have been overfished and they are all on the IUCN Red list of Threatened species. So you won’t probably be able to encounter sharks. If lucky, or not, depending of the way you feel about it, you might see a white-tip reef shark, a whale shark or a great hammer-head one! Sahl Hasheesh is a new resort 18 km south of Hurghada International Airport stretching between the longest swimmable bay on the Egyptian Red Sea Coast and a desert mountain range, the Red Sea Mountains. Entirely built on a private property this huge hotel complex is open only to the guests and to the hotels’ staff and an efficient security service is in charge of your peace of mind! It is already renowned for its stunning beaches and its excellent nearby diving spots including Abu Hasheesh Island, a local protected area with its gorgeous reefs and flourishing marine life. Two golf courses are under construction, both of them overlooking the seaside and should be opening soon. In the resort centre called ‘The Village” you will find shops, bars and restaurants. The local food is not different from the one you find in other eastern Mediterranean countries: stuffed vegetables, shawarma a kind of lamb sandwich, tajine, falafel… If very hungry you can try some Koshary a cheap and nourishing Egyptian dish made with macaroni, lentils, rice and cheek peas! The “Village” that you can reach from every hotel by following the seafront promenade, is also the starting point for an excursion to the mountains driving a SUV or riding on a camel to feel like a Bedouin! From the jetty you can get onboard a glass-bottom-boat to discover the undersea offshore world without getting wet or you can experience parasailing. 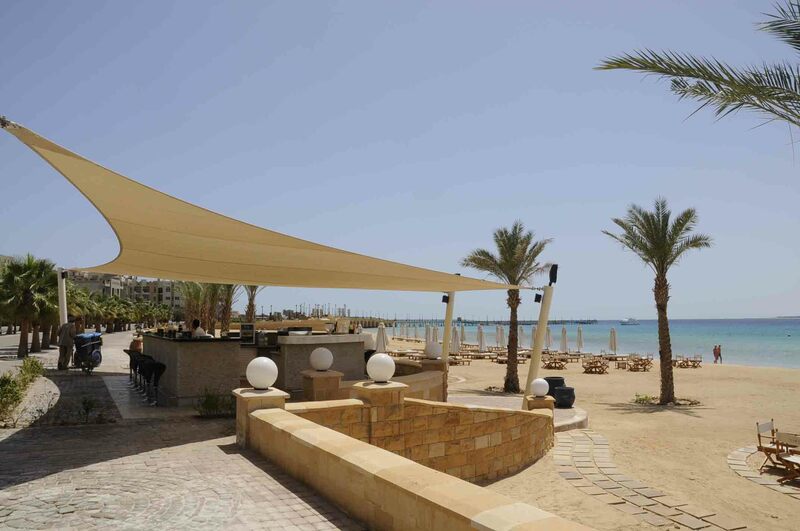 Mainly the Sahl Hasheesh hotels are meant for restful holidays enjoying the beach with your loved ones. 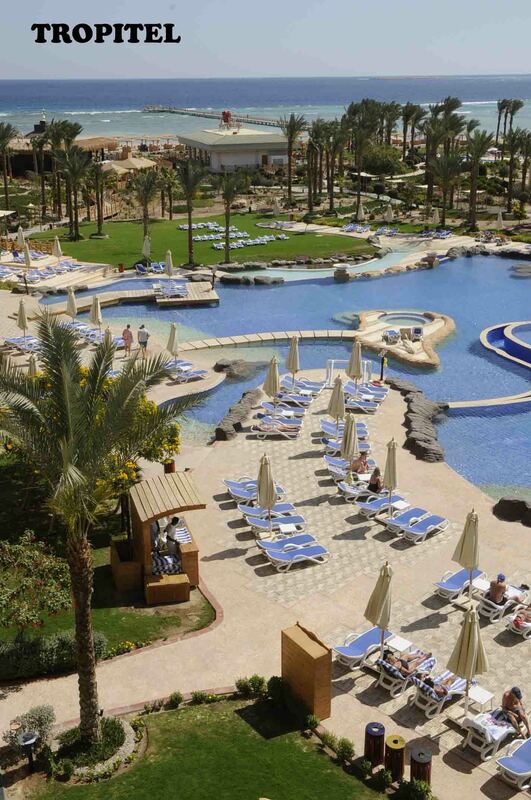 The Tropitel Sahl Hasheesh hotel is a very affordable all-inclusive 5-star hotel ideal for couples or family holidays. The horseshoe shaped building in which every room has a sea view surrounds 3 cascading swimming pools and lovely gardens. All rooms are particularly large and clear, making your stay very comfortable. Dozens of large individual wooden roofs, scattered on the long sandy beach, offer to the guests lying down on the beach chairs a kind protection from the strong sun, especially for any newcomer with fragile pale skin. From the private beach you can walk onto the jetty and its pontoon and dive into the aquamarine waters to enjoy snorkelling. With its seven restaurants and bars you will have a very wide choice: the “Palm Restaurant” is the main one with a daily different buffet and you can enjoy your meal on its large terrace overlooking the swimming pools and the sea. The diving centre is well equipped, with all sorts of diving activities for beginners or experienced divers with a good value for money. Even if not too big the spa provides a wide range of treatments: massage, sauna, steam bath, Jacuzzi, aqua-muddic treatment… And a private pool! It’s truly a nice place for relaxing holidays in a friendly atmosphere, and prices are affordable, especially for those travelling with kids. The Baron Palace Resort is a brand new luxury hotel that demands a higher budget. High luxury always has a cost. Arriving in the huge lobby is entering an elegant oriental world with its impressive patterns, precious materials, moucharaby panels. The 6 pools are amazing with a total surface of 5000 sq meters! The main pool with its infinity effects overlooking the private beach makes you feel like you could touch the sea. One of the 3 wings of the hotel is dedicated to families with a huge kid club and kid pool. There is even a teenage area with an alcohol-free bar, music and an amusement arcade. But there are also 33 honeymoon suites with their private pool to share a new life in private! Of course there is a wide range of gastronomic restaurants with really delicious cuisine: Egyptian, Italian, Mexican, Asian, Japanese, BBQ… When booking your room on line you can choose an all-inclusive formula or the half-board accommodation or B&B. Make your own choice, nothing is imposed, these are your holidays! As you could expect the Spa is splendid, blending a sophisticated decoration with quality treatments: Turkish bath, sauna, in door and outdoor pools. Not to forget the Adam and Eve private couple treatment room!